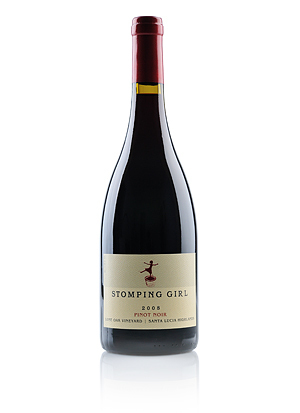 2008 Stomping Girl Pinot Noir Released! Order yours before February 1st and save 10%. Just put your order in the shopping cart and use the coupon code: PreRelease. Celebrate with us at our February 6th 2-4 PM Release Party at the winery at 2323 4th St, Berkeley, pick up your wine there and also save on shipping. Just place your order by February 1st and designate Pick up/Local as your shipping option. Otherwise, wine orders will be shipped out on February 1st, weather permitting. Stomping Girl produces very small lots of handcrafted, artisanal Pinot Noir and 2008 is our first commercial vintage. Consider this an opportunity to buy some to enjoy now and some to tuck away in your cellar for future special occasions before it’s gone. After all, there is only one first release of Stomping Girl Pinot Noir.